Yesterday’s trip to CVS was a booming success. If you need diapers, sodas and/or dish soap, this is a great deal! I bought three packs of Huggies diapers, three 12 packs of soda, two Palmolive dish detergents, a small mouthwash and a body mist. 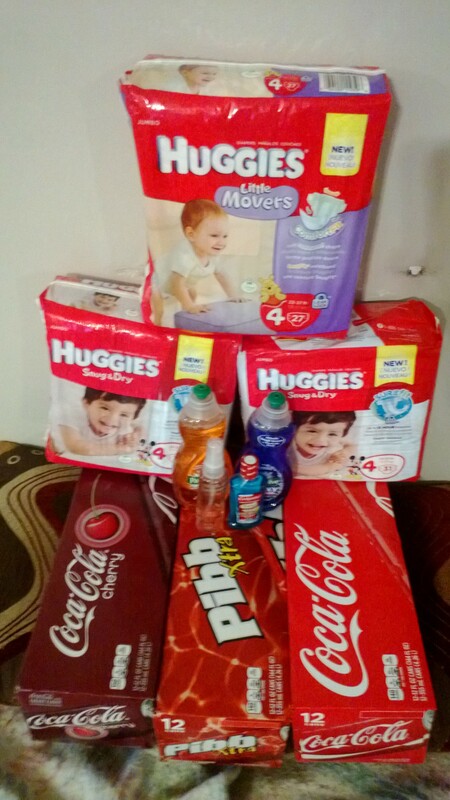 Huggies and Palmolive were part of a deal where you get $10 Extra Care Bucks if you spend $30. I bought three packs of Huggies diapers at $9.49 each, used two coupons (if I had found the third that had fallen out in my purse, this deal would’ve been $2.00 better) and got two Palmolive dish soaps to complete the $30 minimum. There is a coupon printing from the magic red machine for a travel size Colgate mouthwash, making it 50 cents. I got a free body wash coupon for my birthday. The 12 pack Coke products are three packs for $11, with $2 Extra Care Bucks for buying three packs. I had $10 Extra Care Bucks left from a previous shopping trip a few weeks ago. I also had a $5 off of $30 and $5 off of $15 coupons, one loaded on my card from an email and one a printed coupon, which both were able to ring on this transaction. If I hadn’t had a 4 year old acting like a lunatic at the register, I’d planned to use the $10.00 Extra Care Bucks from the diapers and dish soap to pay for most of the drinks, which is what I’d suggest you do. In that case, you’d have only $14.47 out of pocket, or $12.47 if you can get the three Huggies coupons, unless you come in with the Extra Care Bucks like I did. What has been your favorite deal you’ve scored lately? Categories: Frugal Family, Sites for Savings | Tags: babies, bargain, budget, cheap, Coca Cola, Coke, coupons, coupons.com, CVS, diapers, dish soap, huggies, Palmolive, saving, shopping, sodas, Swagbucks | Permalink.